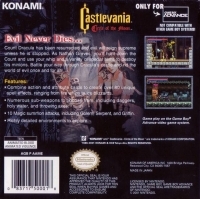 Developer(s): Konami of America, Inc.
Count Dracula has been resurrected and evil will reign supreme unless he is stopped. As Nathan Graves, you'll hunter down the Count and use your whip and a variety of special items to destroy his minions. Battle your way though Dracula's castle and rid the world of evil once and for all! • Combine action and attribute cards to create over 80 unique spell effects, ranging from fire whips to ice blizzards. • Numerous sub-weapons to choose from, including daggers, holy water, and throwing axes. • 10 Magic summon attacks, including Golem, Serpent, and Griffin. • Richly detailed environments to explore. 02-26-2019 silverbow Box Text Evil Never Dies... Count Dracula has been resurrected and evil will reign supreme unless he is stopped. As Nathan Graves, you'll hunter down the Count and use your whip and a variety of special items to destroy his minions. Battle your way though Dracula's castle and rid the world of evil once and for all! Features: • Combine action and attribute cards to create over 80 unique spell effects, ranging from fire whips to ice blizzards. • Numerous sub-weapons to choose from, including daggers, holy water, and throwing axes. • 10 Magic summon attacks, including Golem, Serpent, and Griffin. • Richly detailed environments to explore. 09-19-2011 scott Box Text Evil Never Dies... Count Dracula has been resurrected and evil will reign supreme unless he is stopped. As Nathan Graves, you'll hunter down the Count and use your whip and a variety of special items to destroy his minons. Battle your way though Dracula's castle and rid the world of evil once and for all! 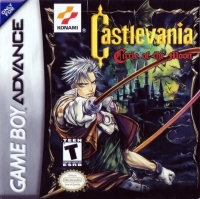 This is a list of VGCollect users who have Castlevania: Circle of the Moon in their Collection. This is a list of VGCollect users who have Castlevania: Circle of the Moon in their Sell List. This is a list of VGCollect users who have Castlevania: Circle of the Moon in their Wish List.